The Friendship Center Program offers social and recreation outreach centers for adults with mental illnesses. Center meetings run 3 to 4 hours and are held Monday through Friday, and one Saturday per month in churches and community rooms throughout San Mateo County. Individuals who would like to attend the Friendship Center Program may just drop in during a scheduled meeting. First time participants may call the MHA office at 368-3345 to receive a Friendship Center booklet and a monthly calendar of activities and outings. There is no charge to participate in the program. Nominal fees and advance sign ups may be requested for outings and trips. Snacks or lunches are usually provided. Participants in the Friendship Centers are considered "members" who are encouraged to participate in the daily operation of the program. Anyone who can benefit from the program may become a member. Attendance is voluntary. 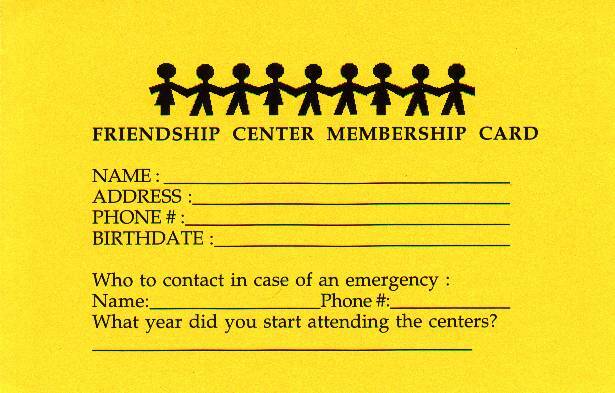 The Friendship Center Program was established in 1970. Over 350 members attend the Friendship program each year. 9:30 am to 1:00 pm. Card games, board games, lunch, bingo, group singing, holiday parties, guest speakers, walking, badminton, poetry telent show, carnival games, pizza parties, croquet, softball, volleyball, celebrating birthdays, movie videos, charades, exercising/stretching, crafts, fashion show, scavenger hunt, frisbee, painting. First Aid, money management, relaxation, communication, goal setting, HIV/AIDS education, self-esteem, hygiene and grooming, earthquake preparedness, nutrition and cooking, stress management, symptom management, current events, creative writing, relationship class, independent living. Picnics and barbecues, theatrical plays, baseball games, pizza parlors, billiards, brown bag concerts, bay cruises, Monterey and Carmel, Golden Gate Park, San Mateo County Fair, wine country, San Francisco and Oakland Zoo, Alcatraz, Pier 39, Roaring Camp Railroad, Muir Woods, Chinatown, Ano Nuevo elephant seals, Lawrence Hall of Science, tours, east/west shrine football game, Ardenwood farm, Japantown, Foothill College Observatory, Coyote Point, Larkspur and Tiburon, bowling, tide pooling, shopping malls, museums, movies, art festivals, Sausalito, Marine World, cable car rides, Sacramento, Santa Cruz, Great America, Fisherman's Wharf Ghiradelli Square, Petaluma, San Francisco and Oakland, exploratorium, Winchester mystery house, renaissance and dickens faire, half moon bay, union square, north beach, Canada college concerts, Treasure Island, allied arts guild, Jack London square.